The capital city of Nevada is Carson City. 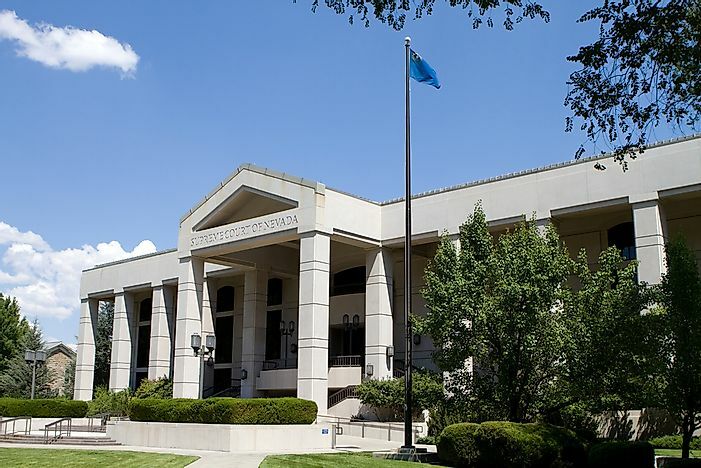 The Supreme Court of Nevada in Carson City. Nevada is the 7th largest and the 34th most populous state of the United States of America. It joined the Union on October 31, 1864. It was annexed by the United States in 1848 during the Mexican–American War and became part of Utah in 1850 before it became the State of Nevada in 1864. After the construction of the Hoover Dam and the stock market crash of 1931, the state of Nevada legalized gambling through Assembly Bill 98 with the intention of increasing the state revenue. The city of Las Vegas in the Mojave Desert is the 28th most populous city in the US and is famous for gambling including 24-hour casinos and vibrant nightlife. However, Carson City outwits Las Vegas as the capital city of the state of Nevada. The Consolidated Municipality of Carson City is the capital of the state of Nevada. It covers an area of about 157 sq mi, and has a population of approximately 57, 000. The city is named after Kit Carson, an American Mountain man who explored the area between 1843–44. In 1966 the state through a referendum approved the merger of Ormsby County and Carson City to form the Municipality of Carson City. In 1991 the city council passed a master plan that prohibits the construction of buildings taller than the State Capitol building within 500 ft.
Much of Nevada has a desert environment, including Carson City. Carson City experiences a semi-arid climate with hot summers and cool and cold winters. It experiences four seasons which are fairly mind compared to other parts of the country. During the winter moderate snowfall of about 8.9 inches is experienced. Precipitation occurs during winter and spring, but the summer is much drier than the neighboring state of California. Carson City exhibits a diverse and growing economy. It acts as the regional and commercial and retail hub for Northwestern Nevada which is known for its irrigated farms, mining of silver and other minerals, and livestock farming. The service industry accounts for 30% of the workforce while the manufacturing industry employs 14%. After gambling was legalized in 1931, the number of tourists visiting the city has also been on a steady increase. The public sector employs 25% of the work force since the city acts as the center for federal and state governments. After the merger of Ormsby County with Carson City the county dissolved and is currently governed as part of the Consolidated Municipality of Carson City. A five-member board consisting four supervisors and a mayor is responsible for governing the city. Each of the four supervisors represents a ward of which they must be residents of that particular ward. The supervisors and the mayor serve a four-year term. The mayor and the supervisors from Ward 2 and for are elected during the general elections in the US while representatives from Ward 1 and three are elected during the even years in between the presidential elections i.e. the same year gubernatorial elections are held.